Are firms in India credit constrained? This article uses variation in access to a targeted lending program to estimate whether firms are credit constrained. While both constrained and unconstrained firms may be willing to absorb all the directed credit that they can get (because it may be cheaper than other sources of credit), constrained firms will use it to expand production, while unconstrained firms will primarily use it as a substitute for other borrowing. We apply these observations to firms in India that became eligible for directed credit as a result of a policy change in 1998, and lost eligibility as a result of the reversal of this reform in 2000, and to smaller firms that were already eligible for the preferential credit before 1998 and remained eligible in 2000. Comparing the trends in the sales and the profits of these two groups of firms, we show that there is no evidence that directed credit is being used as a substitute for other forms of credit. Instead, the credit was used to finance more production–there was a large acceleration in the rate of growth of sales and profits for these firms in 1998, and a corresponding decline in 2000. There was no change in trends around either date for the small firms. We conclude that many of the firms must have been severely credit constrained, and that the marginal rate of return to capital was very high for these firms. Abhijit V. Banerjee and Esther Duflo, The Review of Economic Studies 2014 81: 572-607. Among many of the things I do on the internet during my tea/coffee breaks is searching various research repositories for research on India. Today, one such random search on NBER gave an impressive list of papers- looks like Spring break reading is all set! I came across this interesting paper by Gustavo Ventura and his coauthors titled “Talent, Labor Quality, and Economic Development” in which they use PISA scores as a measure of quality of labor. They show that there are huge differences between labor quality between rich and poor countries based on these scores and they could explain some of the income differences across the world. Developed countries like the US, Canada and Western Europe have been investing in education for the past 200-300 years. The dividends that are being reaped now are because of this huge investment. Unfortunately, India does not figure into the analysis because we have shied away from taking the test. Only two states, Tamil Nadu and Himachal Pradesh, volunteered and the results are not at all encouraging. You can find some analysis here, here and here. Employers in India have been lamenting about quality of human capital for a while now. There is an urgent need of reform starting from schooling to address such concerns effectively. Of course there are Indian kids who could surpass the rich country kids in these tests- all the ones who would eventually go to IIMs, IITs, and other elite educational institutions in India for example could do that. Students who come from educated families in general will be also in this list. But all said and done this is still a tiny winy percentage of the population. To reap the demographic dividend for economic growth, skill improvement needs to happen at much broader level than that. One could also argue that PISA tests does not really measure skills. Pratham has been conducting its own tests and the results are not very different! How are we going to do this? Poor infrastructure, Teacher absenteeism, and quality are some of the major problems at all levels of education in India. Some of it would need more investment but a lot could be achieved if incentive structures are changed to motivate the stakeholders to improve outcomes. For example, curriculum and school calendars may have to be revised to meet the local constraints and maximize attendance and learning. Research shows that poor quality of schooling reflects on performance in higher education and eventually the job market outcomes. This provides additional rationale for improvement of schooling across the board. As we are on the topic of unused capacity and perverse incentives it has to be noted that this problem is not only limited to schooling. I know colleges in Pune, India where the classrooms are empty while students pay through their nose for coaching classes. The quality of education provided is overall abysmal. In order to get as many students through the college system as possible, there has been significant dilution of syllabus for almost all the courses through out. Centralized and standardized examination system has only made matters worse. It has taken away the agency from college teachers- no wonder there is huge apathy towards increased effort. Moral of the story: education in India needs reform! This is one area where government spending and investment could really make a difference. The story about India’s PISA scores only underscores the dangers of continued neglect of such impetus to education. In the wonderland of Indian managers! A field experiment reveals that improvement in managerial practices improved productivity and also paved way for expansion. The question as to why these firms did not adapt such practices prior to being part of the experiment has some obvious answers. Family control of firms, lack of competition because of higher tariffs and lack of external financing, etc. While Indian policy makers attack the population growth problem using variety of incentives, it looks like the economic incentive trumps all others. In a recently published paper in the Quarterly Journal of Economics, Robert Jensen finds that increased awareness of prospects of gainful employment made the women facing them to be less likely to marry and have kids than those who were not aware of such opportunities. Those married were also more likely to limit the number of kids in order to pursue a steady career. The increased economic opportunities increased the opportunity cost of getting married and having kids leading to a substitution away from them. A good example of rational behavior from rural India. You can find the paper here. My article in a recent issue of Economic and Political Weekly on Macroeconomics curriculum in India and the US. Gender of Politicians and its effect on educational outcomes. A recent paper in the American Economic Journal: Applied Economics carries an article by Irma Clots-Figueras that claims that the gender of politicians has influence on educational attainment in a district where these politicians are elected. More specifically in urban areas, the probability of completing primary education increases if the elected candidate is a female. Everyone knows that the amount of rainfall the Indian economy receives every year is an important determinant of livelihood of lot of people. 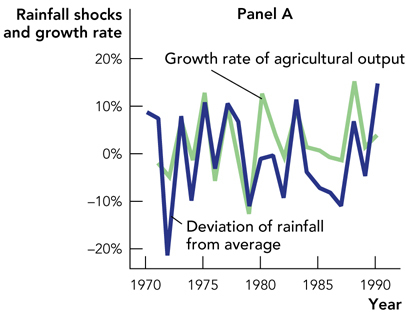 I was looking for some measure of importance of rainfall shocks and interestingly, I came across these couple of graphs in Cowen and Tababrrok’s Modern Principles: Macro-a text I use for my principles classes. Not surprisingly, the agricultural output co-varies quite closely with rainfall as you can see in Panel A. But if you see Panel B, after 1995 the covariance with overall GDP shows reduction. This simply reflects the fact that the Indian economy seems to have diversified after the economic reforms of 1991.Important questions arise out of these pictures: Post liberalization, agriculture output continues to be at mercy of nature’s vagaries. This sector still employs significant proportion of working population (58%) compared to the non-agricultural sector(42%). 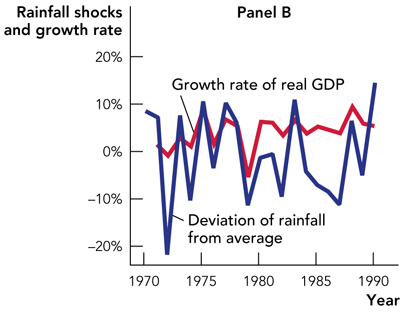 If the overall GDP shows less sensitivity to rainfall shocks after 1995, then a relatively smaller section of working population seems to be insured from these shocks. This inequality in terms of insuring against real shocks and its implications for effective policy design are definitely worth exploring. Technology and geting the price right! The Digital Provide: Information (Technology), Market Performance, and Welfare in the South Indian Fisheries Sector, by Robert Jensen in the Quarterly Journal of Economics, August 2007, Vol. 122, No. 3, Pages 879-924. When information is limited or costly, agents are unable to engage in optimal arbitrage. Excess price dispersion across markets can arise, and goods may not be allocated efficiently. In this setting, information technologies may improve market performance and increase welfare. Between 1997 and 2001, mobile phone service was introduced throughout Kerala, a state in India with a large fishing industry. Using microlevel survey data, we show that the adoption of mobile phones by fishermen and wholesalers was associated with a dramatic reduction in price dispersion, the complete elimination of waste, and near-perfect adherence to the Law of One Price. Both consumer and producer welfare increased. “Information, Direct Access to Farmers, and Rural Market Performance in Central India”, by Aparajita Goyal. American Economic Journal: Applied Economics, forthcoming. cant increase in soy price after the introduction of kiosks, supporting the predictions of the theoretical model. Moreover, there is a robust increase in area under soy cultivation. The results point towards an improvement in the functioning of rural agricultural markets.